If you haven’t discovered how delicious and easy chicken thighs are, these crispy baked buttermilk chicken thighs are the perfect gateway drug. I’m only partially kidding… When you have a taste of the super crispy flavorful skin and juicy meat inside you’re sure to get hooked! I love how cheap bone-in and skin-on chicken thighs are, I can usually find them for around $1-$1.50 per pound. This definitely helps to balance out our food budget since I’m also a big fan of $30 per pound steaks as well! This recipe for crispy baked buttermilk chicken thighs was inspired by Samin Nosrat, author of one of my favorite books on cooking “Salt, Fat, Acid, Heat: Mastering the Elements of Good Cooking”. 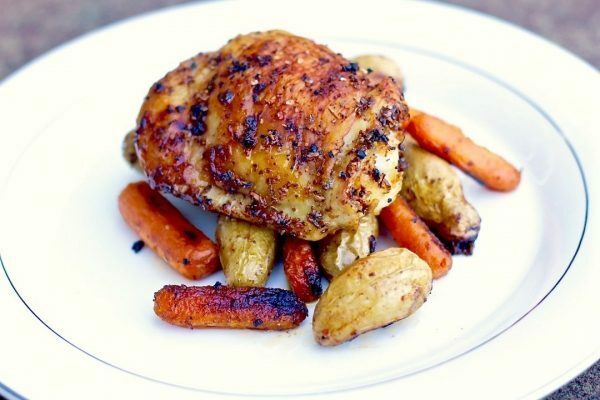 She shares a super simple recipe for a whole roasted chicken. Since I don’t buy whole chickens very often, I made a few changes and use the marinade for chicken thighs instead. Try this recipe out next time you’re making chicken for dinner and I promise you’ll be impressed! Start the night (or day) before you’re planning to make these. This is a super important step and makes all the difference! Pat dry chicken thighs and coat generously with kosher salt on all sides. 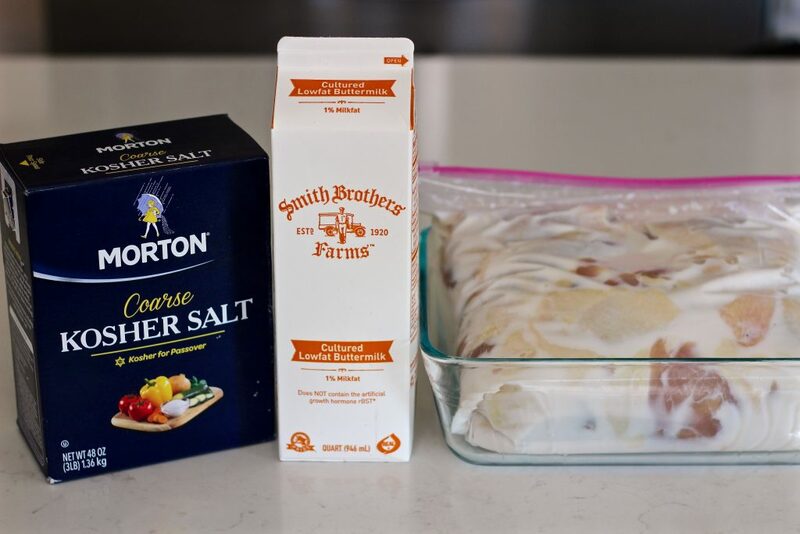 Place in ziplock bag and add two cups of buttermilk. Remove ziplock bag from refrigerator and allow to sit on the counter and come to room temperature for about an hour. This is a great trick I learned from “Salt, Fat, Acid, Heat”. Allowing the chicken to come to room temperature first speeds up baking time (which is great on warm days) and helps the chicken cook more evenly and skin get really crispy! 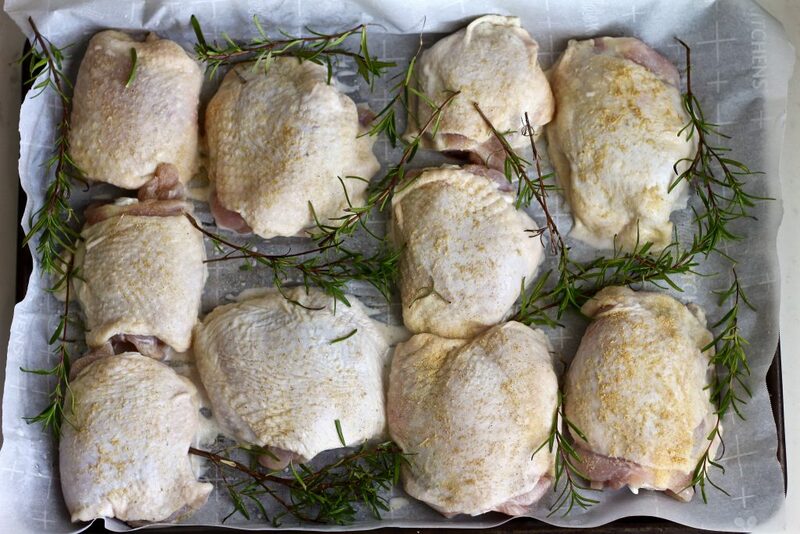 Line a large baking sheet with parchment paper or foil. 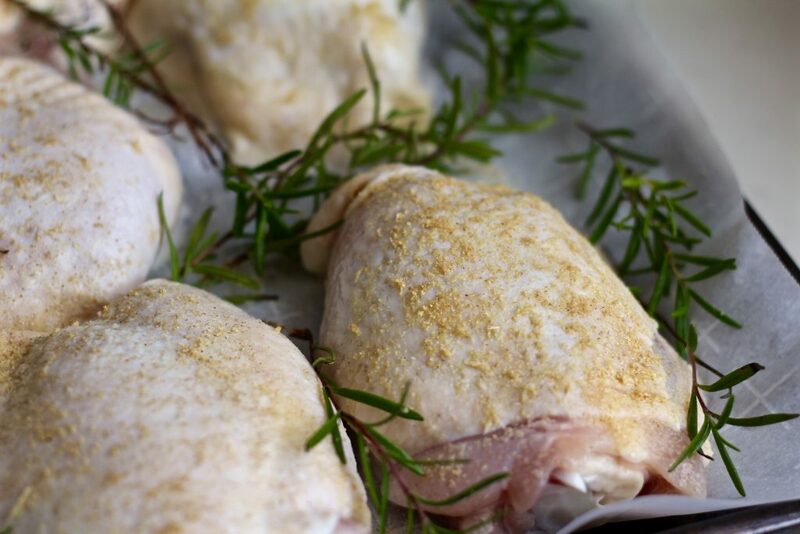 Remove one chicken thighs from the marinade and either shake off or dab off excess buttermilk using a paper towel. 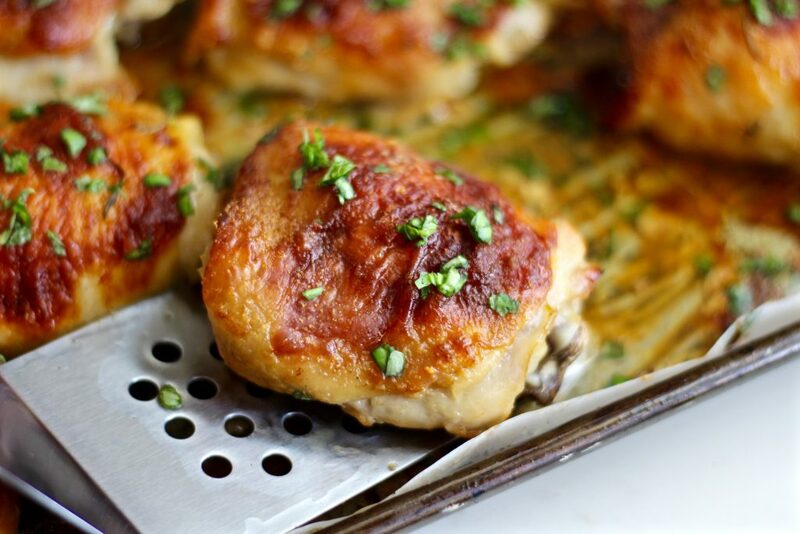 Arrange chicken thighs skin side up so they aren’t touching on the baking sheet. 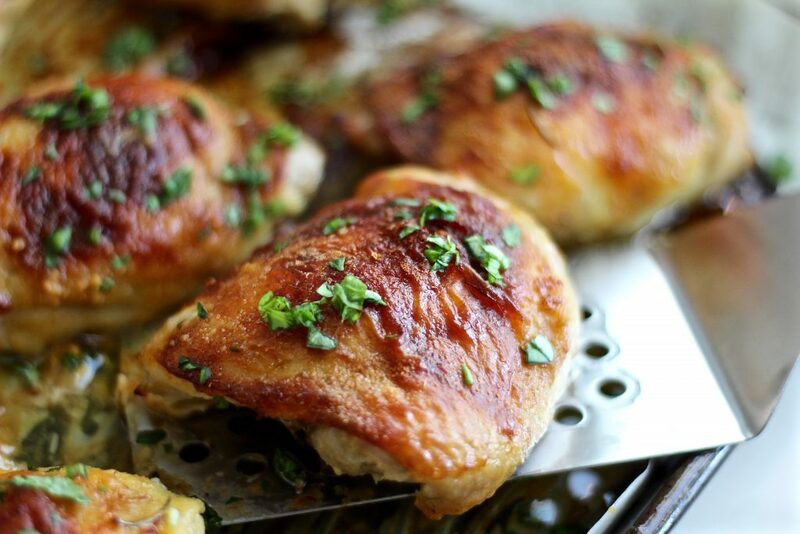 Place chicken thighs in hot oven and bake for about 45 minutes until skin is a rich brown color and juices run clear. 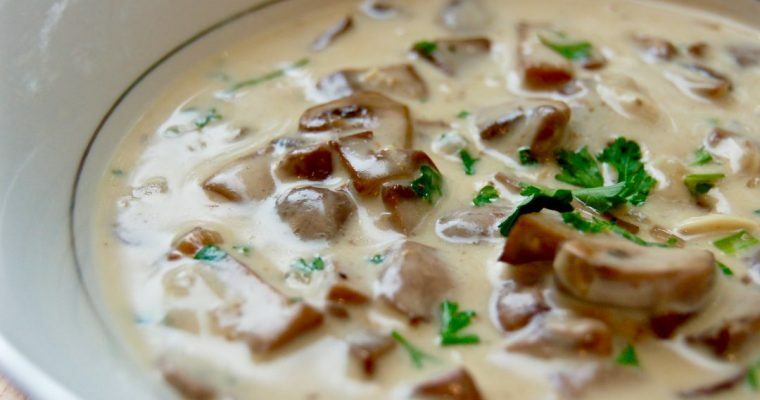 The milk solids in the buttermilk quickly caramelize and give the skin a dark roasted color and crispy texture. Don’t be alarmed if the skin looks darker than it normally would, it’s not burned! 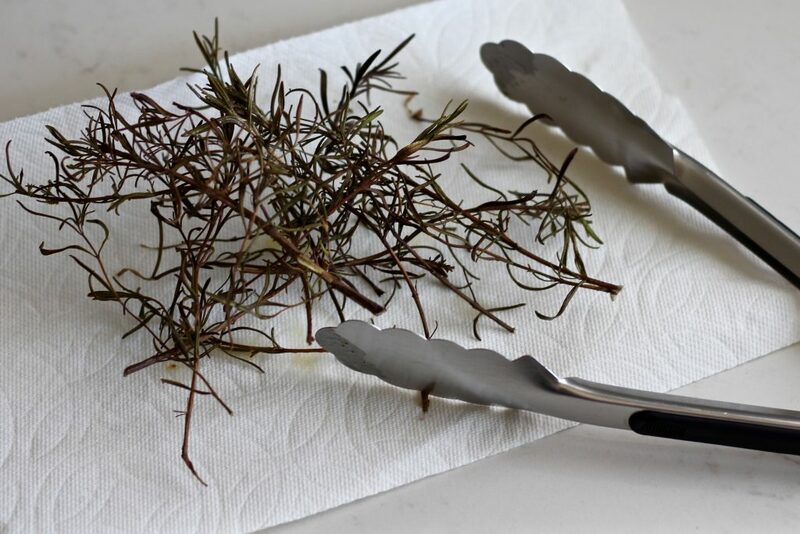 ***If baking with fresh rosemary sprigs, remove them about halfway through the baking process to avoid a smoky oven! Serve these crispy baked buttermilk chicken thighs with garlic mashed potatoes, mushroom risotto, or a fresh green salad for a lighter meal. You really can’t go wrong with the sides here because this chicken goes with everything! 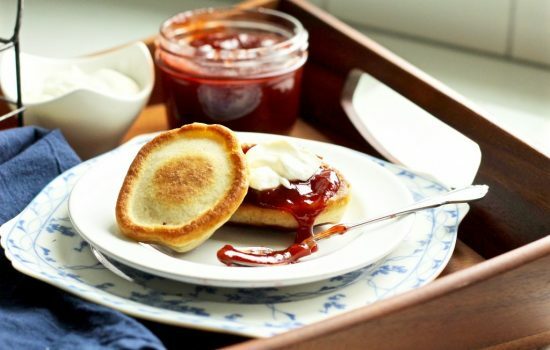 Start the night (or day) before you're planning to make these. This is a super important step and makes all the difference! Remove ziplock bag from refrigerator and allow to sit on the counter and come to room temperature for about an hour. 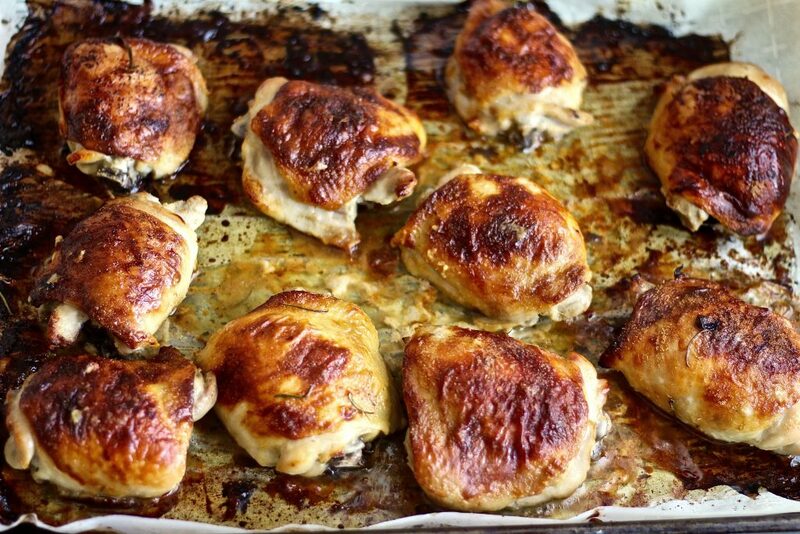 Arrange chicken thighs skin side up so they aren't touching on the baking sheet. 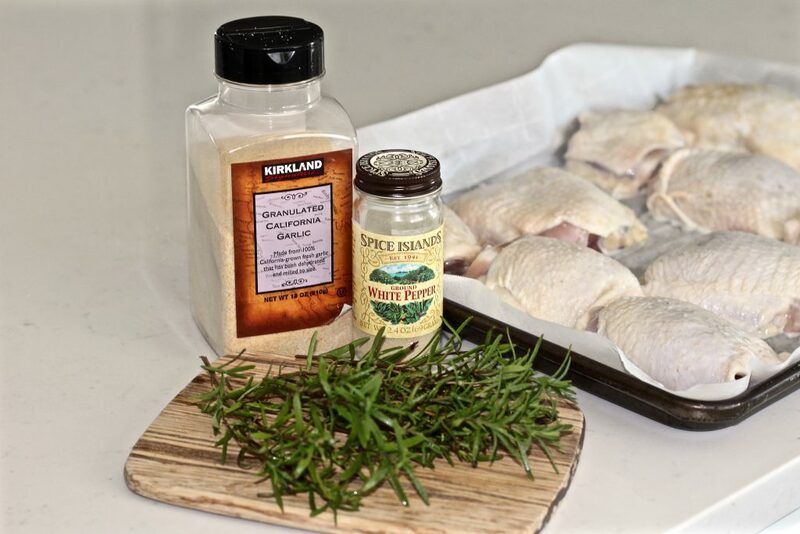 Optional: place a few sprigs of fresh rosemary between pieces of meat and sprinkle some pepper (white or cayenne are my favorite) and garlic powder on top of the chicken. 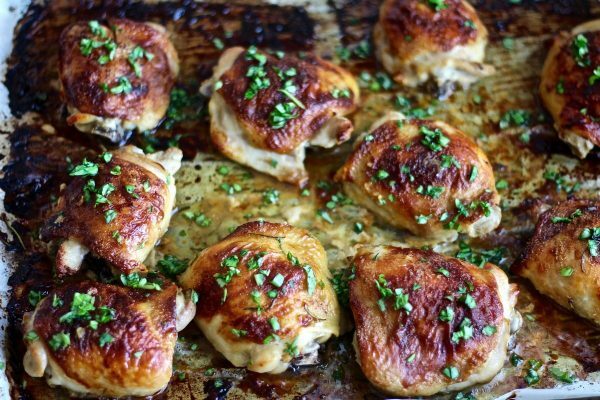 Serve these crispy baked buttermilk chicken thighs with garlic mashed potatoes, mushroom risotto, or a fresh green salad for a lighter meal. You really can't go wrong with the sides here because this chicken goes with everything!